In President Trump’s response letter to why he decided to pull-out from the Paris Climate Agreement, one of the reasonings behind it is that the “emissions commitments would require us [the United States] to shift energy production from affordable, reliable fuels to those that are more costly and less reliable.” This statement is at most half-true, as it only looks atthe immediate short-term economic impacts of transitioning to cleaner energy alternatives, while disregarding the long-term economic benefits. Both the affordability and reliability of fossil fuels, comparatively to renewable energy, needs to be re-evaluated. Is the cost of fossil fuel cheaper than renewables? As fossil fuels have been contributing to more than 80% of total electricity generation in the U.S. over the past few decades, undeniably, they are the most important source of energy that fuels the nation (EIA, 2015). However, according to Lazard, a financial advisory and asset management firm, when comparing the prices of unsubsidized fossil fuels to other unsubsidized alternative energy sources, we find that wind and solar power are the most cost-competitive, followed by coal and natural gas (Figure 1). Figure 1. US Unsubsidized levelized Cost of Energy. Source: Lazard, 2016. In fact, with increasing investments into wind and solar, the cost of production for the two have been dramatically decreasing over the past decade. The average price of a solar panel has dropped almost 60 percent since 2011 (SEIA, 2012). The cost of generating electricity from wind dropped more than 20 percent between 2010 and 2012 (AWEA, 2012). Figure 2. 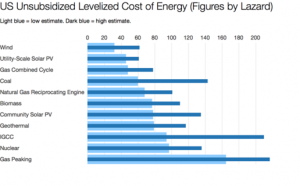 Unsubsidized Levelized Cost of Energy. Source: Lazard, 2016. With continued investments into renewable energy, the UCS (2009) predicts that if a policy aiming for a 25% renewable electricity standard would have major economic benefits, leading to 4.1 percent lower natural gas prices and 7.6 percent lower electricity prices by 2030. In countries where investments into solar energy have been emphasized, such as Saudi Arabia or India, the cost for solar cells have been rapidly decreasing, with the highest capability of producing energy at 0.0029c/KWh, comparatively to the 0.06c/KWh of coal, or 0.04c/Kwh from natural gas (Micu, 2016). Upon discussing the costs of fossil fuel, it is hard to ignore the negative externalities that is created from the extraction and burning of fossil fuel. The cleanest fossil fuel – natural gas, still emits between 0.6 and 2 pounds of CO2 equivalent per kilowatt-hour, while coal emits between 1.4 and 3.6 pounds of CO2E/kWh . Renewable energy sources emit significantly less CO2, with wind emitting only 0.02 pounds of CO2E/kWh and solar 0.07 to 0.2 CO2E/kWh (UCS, 2013). As CO2 emissions directly contribute to the greenhouse effect, a decrease in CO2 emissions from transitioning to cleaner energy alternatives is much needed. In addition to contributing to the global problem of climate change, the burning of fossil fuel in electricity plants has also been linked to major health problems nationwide. The air and water pollution emitted by coal and natural gas plants is linked to breathing problems, neurological damage, heart attacks, and cancer. The aggregate national economic impact associated with these health impacts is between $361.7 and $886.5 billion, or between 2.5 percent and 6 percent of gross domestic product (Rizk, 2013). What future does President Trump want for the United States? According to a report by National Renewable Energy Laboratory (2012), with the current renewable electricity generation technology (not even including the technological advancements within the next few decades), along with a more flexible electric system, renewable energy is fully capable of supporting 80% of total US electricity generation in 2050, while reliably ensuring, on an hourly basis, that energy demand is met in every region in the U.S. Thus, it is up for President Trump to decide the future of the country’s electricity system. Given the economic, health, and environmental benefits of transitioning to a cleaner energy grid, it still staggers me how the President is still in full support of the coal industry and out-right criticizing the transition to renewables. AWEA. 2012. Federal Production Tax Credit for Wind Energy. Mai, T.; Sandor, D.; Wiser, R.; Schneider, T (2012). Renewable Electricity Futures Study: Executive Summary. NREL/TP-6A20-52409-ES. Golden, CO: National Renewable Energy Laboratory. Union of Concerned Scientists (UCS). 2009. Clean Power Green Jobs. US Energy Information Administration, 2015. Fossil fuels have made up at least 80% of U.S. fuel mix since 1900. Retreived from https://www.eia.gov/todayinenergy/detail.php?id=21912. SEIA. 2012. Solar Market Insight Report 2012 Q3. This entry was posted in Trump & Paris Agreement. Bookmark the permalink.